Like most photographers, you will start to get a collection of old photo gear. Some of it surplus to requirements, some of it broken and not worth repairing or too difficult to get repaired in this country, and much has become redundant because you have changed camera systems (film to digital for example), or even changed formats (6×6 to 35 mm for example). For myself, after using Nikon for donkey’s years, I purchased a Panasonic Lumix Digital DMC-FZ50. It took a year of deliberation (some might call it ‘hesitation’ or just plain ‘dithering’) before I made the fateful decision to a) go digital and b) go Lumix, after more than 20 years of using Nikon. Of course, some of you will ask why didn’t I stay with Nikon, with its full range of digital SLRs? Good question, but easily answered. The upper level Nikons are now very expensive, and whilst I had some excellent Nikon manual focus prime lenses, they were not going to be all that compatible with the new Nikon digital auto-focus systems. And have you seen how heavy the Nikons are these days? Having made the irrevocable decision, I looked at my now defunct Nikon 35 mm film system. 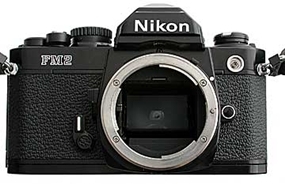 I had two cameras, a much loved FM2N, and an FA. The FM2N was the typical journalist’s workhorse with more rolls of film through it than I’ve had hot dinners, whilst the FA was the back up. Only thing was the FA was no longer working, having some kind of internal problem, by which the mirror was locked in the “up” mode. Quite frankly, as far as I was concerned, these items were now surplus and it was going to be very unlikely that I would use any of it again (although I would still take the FM2N out of its bag and lovingly stroke it every so often). That little lot came to over 20,000 baht, which certainly made purchase of the Lumix a breeze (duty-free price). What made the exercise even more astounding, was the number of ‘watchers’ who had been looking as the bids went in on eBay. 14 looking at a broken FA and someone who paid almost 1,500 baht for it. The lenses all went for very good money, though I would have thought the 135 mm would have been more desirable than the 50 mm, but the 24 mm did attract the highest bid, as I thought it would. Previous article“Natural” remedies and EBM? Are they good for you?